Middle East dominance: The foreign policy aspects of the debate focused almost exclusively on Libya, Israel, Syria, Iraq, Iran, and Afghanistan. Binyamin Netanyahu's name was invoked eight times, far more often than any other person other than Barack Obama and Mitt Romney. The Euro crisis, the recent reelection of Hugo Chávez in Venezuela, and the country of India all went unmentioned, while relations with Russia and China came up only glancingly. So chaotic, volatile, and murderous has the Middle East become that American politicians are quasi-experts on it to the point of naming the rival Afghan valleys they'd visited. The region has also become an integral part of a voter's decision on whom to vote for for president. That Tunisia, Turkey, Jordan, Yemen, Saudi Arabia, and Bahrain never came up, while Egypt and energy were mentioned only once, points the depth of the Middle East issues bench. 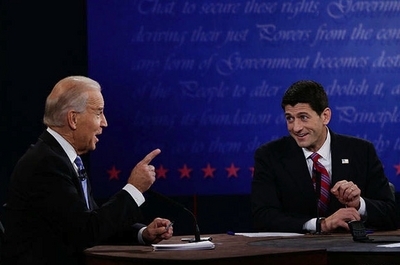 Joe Biden lectures Paul Ryan in the vice-presidential candidates debate on Oct. 11, 2012. Joe Biden's smirk: Actually it was not just the smirk – it was also the false hilarity, the 82 interruptions of Ryan, the finger pointing, the preening arrogance, and the talking down to the audience – that overshadowed all else in the debate. Not until the last fifteen minutes did Biden talk like a normal human being, and then he became quite effective. Before then, however, his ugly demeanor overwhelmed his words, leaving a powerfully unpleasant impression. In contrast, Ryan spoke earnestly and respectfully, even while getting in a couple of sharp elbow jabs.